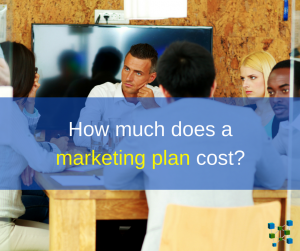 How Much Does a Marketing Plan Cost? It depends on the deliverable. The cost of a marketing plan developed by a seasoned marketing strategist will vary depending on the nature of your business. A simple company structure led by an entrepreneur is very different for a marketing company to navigate versus herding multiple decision makers in a complex corporate structure. Most marketing consultants price according to both their time involved and the level of detail they will deliver. One of the first things to understand in looking at how much a marketing plan will cost is what the marketing plan actually entails. The very nature of a marketing plan implies that it is customized for your business, just as having a business plan implies it is specifically created for your company. You certainly wouldn’t take someone else’s business plan to the bank and expect to receive financing and you wouldn’t dream of handing a generic checklist of business initiatives to your banker and expect a favorable response. You may balk at the absurdity of the idea of anyone thinking they can pass off a generic checklist as a business plan in order to obtain working capital, but I tell you this because I have come across marketing companies out there who are selling “marketing plans” which are quite literally generic checklists. So, just how much money do you have to pony up for a customized marketing plan? Depending on variables such, as the size and complexity of your company and what the specific deliverable will be that the marketing consultants provide, you can expect to invest between $10,000 and $40,000. Some marketing plans are as long a business plan complete with a competitive analysis and a product gap analysis; those types of Marketing Plans are going to run you at the top of the price range, and quite possibly beyond. If you just need a marketing plan which covers fundamentals such as message, market segments, channels to market, ideal clients and a full year of tactics to support your overall objective – that sort of plan is going to be at the lower end of the price range. The most important thing to consider when looking at a marketing consultant or marketing company to develop your marketing plan is to ask specifically about the deliverable. What does it entail? How many meetings will it take to develop the plan? We learned one marketing company charged a business owner a temptingly affordable $1,800 for a Marketing Plan, only to deliver a generic checklist – all of which the business owner had already done. You shouldn’t be paying anyone for a checklist which is the same thing they handed to the last client. That type of document should be a free download on a website, it is not a marketing plan. If it doesn’t start with a strategy session – it is not a marketing strategy. If it isn’t customized for your particular company – it is not a marketing plan. The cost of a marketing plan shouldn’t be looked at as an expense as much as it should be viewed as an investment in your company because it isn’t something you do only once. You will want to create a new marketing plan every year. Once you’ve gone through the process with a marketing consultant, you’ll know what needs to be done and may find you can do it on your own after the first year. So, bottom line – don’t let how much a marketing plan cost deter you from hiring someone to help you. Without it, you’ll waste far more than you spend on your consultant by putting the wrong message in front of the wrong audience on the wrong platforms and blowing through your marketing budget because you don’t understand the right sequence and process to market on social media.